Effective networking is a skillset worth mastering to grow your career to the next level. A recent survey found that 41% of professionals feel like they would like to do more networking, but simply don’t have the time. Being a better networker is one of the top ways to grow your career. We reached out to Julia Breedon, VP, Global Diversity & Inclusion for American Express, to discuss how women can cultivate networking skills to drive their careers to the next level. What are some strategies to consider when networking? Building strong professional relationships—both at the office and outside of it—will always help your career grow. Think about who you want to meet or get to know better ahead of time, also consider what you can bring to the relationship and how you will regularly keep in touch with your new contact following the initial meeting. By expanding your network, you might learn new skills, hear about emerging opportunities, or find mentors who can hopefully one day become your sponsors and advocate on your behalf. You mention that golf is an effective networking tool that crosses gender lines. What type of job titles or fields do you think this applies to the most and why? The golf course is a place where professionals build camaraderie and often hear about emerging opportunities. 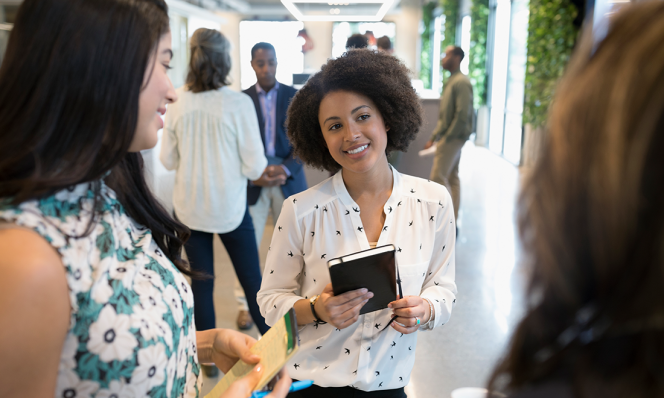 At American Express, we realized that our women executives needed access to more informal networking opportunities, particularly with their male colleagues and business partners. For the past eight years, we have hosted free golf clinics during the workday, to teach senior women golf skills and how to leverage them to build their networks across gender-lines. Today we host the clinics several times per year and have approximately 75 women attend each event. Our colleagues have used this opportunity to broaden their circles both at the company and beyond. Sports in general have the power to unite men and women around a common passion—find your niche and you will find a network. What are other ways that women can improve their networking skills? As women, we are often apprehensive to take the time we need to step away from our desks to meet a colleague for lunch or participate in a Colleague Network. And, as a working mother, it is often challenging to find the time to network at evening events or participate in professional programs over the weekend. But, we need to prioritize networking as an integral part of our job—it can benefit both our personal careers and our employers. Luckily, as online and offline channels converge, it has become easier than ever to find time to fit it all in. When you can’t see a colleague in person, send them a quick email checking in and asking how they are doing. When you meet a new contact, add them on LinkedIn and make sure to reach out when you see updates to their profile. Keep the conversation flowing across online channels and try to find the time to take it offline as well. What are the top three career tips you have for women? Cultivate relationships with sponsors. According to the Center for Talent Innovation, only 13% of professional women have sponsors. Having a true advocate is the key to driving your career forward. Actively manage both your internal and external network. Keep in touch with your former colleagues, build relationships with your current business partners and always set expectations at the right level. Maintain relationships with external recruiters. Even if you aren’t in the market for a new job, it’s important to learn and keep tabs on the external landscape. What leadership programs do you believe corporations can benefit from to erase the gender gap? Employee networks build a strong sense of community for employees from diverse backgrounds. American Express has 15 of these organizations implementing incredible initiatives to develop and help advance our employees’ careers. This spring, I am also helping to plan American Express’ Global Women’s Conference, which will bring together our most senior women executives from around the globe to focus on addressing three main objectives— leadership, ambition, and culture. Our goal is to find even more valuable methods for advancing the next generation of women leaders.